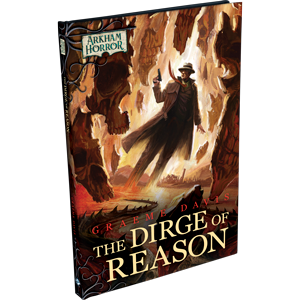 The Dirge of Reason is an Arkham Horror novella by Graeme Davis that throws you headfirst into the roaring twenties where tragedy has struck the small town of Arkham, Massachusetts. During an apparent freak accident, the entire New England Virtuosi Orchestra perished and federal agent Roland Banks has been sent all the way from Washington D.C. to investigate. The official report reads, �Explosion, cause unknown.� The house looks like a howitzer shell hit it, but nobody knows why and the local authorities weren�t encouraged to look very hard. Could it have been bootleggers? A mob hit? Or something more sinister, something unnatural? Now, you can aide Roland Banks with his investigation. Within the pages of The Dirge of Reason, you will find full-color inserts of the agent�s case notes as well as all the evidence at his disposal, including letters, newspaper clippings, and official reports. The hardcover novella also comes with four exclusive cards for Arkham Horror: The Card Game, including an alternate art version of Roland Banks, that enable players to build a distinct deck for the federal agent based on his experiences within the story.